I made my cuts last Sunday in our Stay or Go story. I'll got find the link for you. 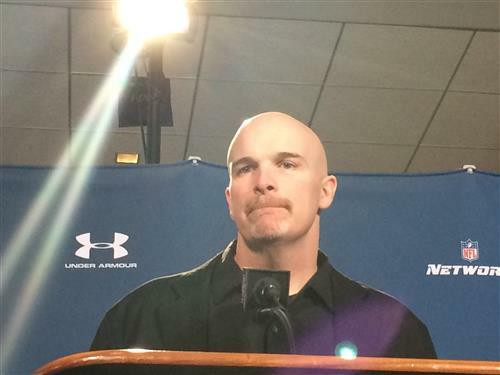 Scott Pioli has to get Dan Quinn better players. Quinn and his staff must develop them. Do you even remember Michael Bennett when he played with Tampa Bay? Quinn got him and turned him into a force. What is the plan to keep from continuing to whiff on depth/player development that has become key for good teams ....staying good? Could be some surprising cuts other than Steven Jackson. D Led. What surprise offseason move do you think is in the works? I do not., But I would see how much it would cost to go up and get Leonard Williams. He's a game wrecker. Do you foresee the Falcons trading picks, anyone on the radar of "must have"? In the grand scheme, would Smith be gone had ATL not lost to Detroit and Cleveland? He'll get a pass. Smitty came out and shocked the Falcons nation with that 11-5 and 9-7. Even though this isn't college and D. Quinn isn't "following a legend" in Mike Smith, how much or little will his start and first couple of seasons be compared to Smitty's as the measuring stick? Taking the under on that with the currently constituted roster. Check back in August after the moves have been made. Over/under Falcons finish 15-16 (middle of the pack) in overall defense next season? I don't think he'd do that. I'm thinking a hefty fine. He likes his hoops. He probably will attend a game, but he's very busy right now. It will depend on what they sign in free agency first. DE in the first is a good match for now. If things were perfect, how do you see the first three picks playing out? DE, OL, LB ... or would we look at RB or TE in Rd. 3. Offensive tackle -- Matthews, Baker and Holmes are all coming off surgery. Schraeder is the top healthy tackle right now. In your opinion, what is the most "critical need" to upgrade on Offense -- either through Draft or FA? This is a deep draft. Any chance we draft at 8 and trade up to get back in the first round again? They've got to take the best player. Cooper could be in play. Armstead has the size and is a good athlete. He's versatile. He could be a Leo in the Quinn defense. 8th pick might be too high, though. Any current players besides Bryant and Jones begun contract talks? Yeldon is a third rounder. Second would be too high for him. DLed...if Fowler and Williams are off the board, who would be the next best fit from your perspective? Good people thanks for stopping by!!!! Let's do this again next week from the Combine. TD and Quinn are talking on Thursday, so there should be plenty to talk about. More rollouts, waggles and crossing routes. They'll go deep after running game is established. Look at old Elway stuff and Texans with Schaub. That's how this offense is supposed to work. Jake Plummer ran it efficiently too. @DOrlanodAJC Could we expect different looks in the passing game from Shanahan? More play-action, spreading WR's around, and more deep balls? I like Perryman. He's a beast! I see a lot of second round LB's going to the Falcons in mocks: Dawson from TCU, Perryman from Miami, Nate Orchard from Utah--who would you prefer, honestly? Hagemen. Maybe Massaquoi or Maponga. Who do you see on our current defense who might blossom under Quinn's direction? Any diamonds in the rough that Nolan and Smith never got the best out of?? I have no idea. I'll check with league officials at the combine next week. There is no companion case to look at so the draft pick is hard to determine. Bill Polian is expecting the league to send strong messages to the Falcons and the Browns for cheating, while New England may walk on deflate gate. When will we know if the Falcons will lose a draft pick over the fake noise? What sort of round are we looking at?